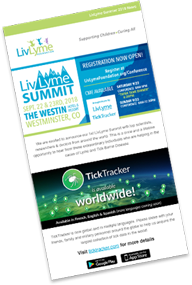 14-year-old Lyme disease patient, advocate and technology pioneer Olivia Goodreau will be in Washington D.C. February 27 – March 1 to be honored for her groundbreaking TickTracker App, which works to gather data and alert the world to tick sightings in an effort to decrease the number of Lyme and tick-borne disease cases. Selected for The Opportunity Project’s 14-week TOP Health Sprint (TOP), Olivia became the youngest inventor ever to participate in the program which is conducted by the Department of Commerce. What is Alpha-gal Syndrome? It is just a meat allergy? How do I get tested? Where in the world are others with Alpha-gal Syndrome? These are just a few of the questions asked and answered on this 2 sided, printable document. The 14-week “TOP Health” tech sprint concluded with 10 teams delivering digital tools — built with Federal data and emerging technologies like AI — to improve clinical trials, experimental therapies, and data-driven solutions for complex challenges from cancer to Lyme and tick-borne diseases. Microsoft and Adaptive Biotechnologies are looking to immunosequence 25,000 people to create an AI-powered model of the immune system. The understandings could power better treatment for cancer, type 1 diabetes, and more. A year ago, Microsoft partnered with Seattle-based Adaptive Biotechnology via its Healthcare NExt initiative. AI has seen a lot of success in the home, but the life-changing effects it could have on healthcare are becoming clear. Last month, IBM announced its fingertip chip for monitoring Parkinson’s, and Harvard followed with a sensor for premature children. Microsoft’s goals are somewhat loftier, and it bought in the new year with an expansion of a key partnership. Its goal is to create a blood test that can scan the body for a number of illnesses at once, including cancer, infections, and autoimmune disorders. The backbone of the AI-based system is now up and running, and the companies are looking for help to decode the data it will provide. A good number of people are constantly disturbed by severe back pain. In many cases, patients are given high doses of analgesics with no major relief. Some will proceed to spinal surgery to alleviate pain from the inter-vertebral disc. Unknown to them, the real cause of the pain is a Lyme infection attacking the joints or the spinal vertebral disc. The same is true of infertility due to Lyme infection that affects both male and female infertility. In most cases, it is not diagnosed. When a new invasive tick species recently appeared in the U.S., government health officials said it was critical to learn more about the parasite, which could be a threat to humans, pets and livestock. But the ongoing government shutdown has halted at least some of this research. Dog owners around New Hampshire are being warned to check their pets for ticks despite the cold weather after a New Boston vet discovered an engorged tick on a dog. Experts say it serves as a reminder that not all ticks die during the winter. Some can even survive in snow. You may have more in common with ticks than you think—at least when it comes to immunobiology. According to Utpal Pal, PhD, a professor of veterinary medicine at the University of Maryland, ticks don’t want to be infected with pathogens any more than you or I do. In fact, their immune systems have developed sophisticated ways of both sensing and suppressing pathogens that may hold the key to developing vaccinations and treatments for tick-borne illnesses one day. As the global climate changes, its effects on the environment are increasingly evident. Average global temperatures are rising, precipitation patterns are shifting, and the frequency of extreme weather events is growing, with impacts on the distribution and viability of all life forms. For human health, one emerging concern is that we do not fully understand how the geographic ranges of vector-borne diseases—those caused by parasites, bacteria, and viruses transmitted to humans via an intermediate host organism—are being influenced by climate change. The Santa Cruz County Mosquito and Vector Control (SCCMVC) Division reminds residents that winter is the season for the western black-legged tick (Ixodes pacificus), the primary vector of Lyme disease and other tick-borne illnesses in Santa Cruz County. On Wednesday, a congressional advisory committee sounded the alarm on Lyme and other emerging tick-related illnesses saying they have become “a serious and growing threat to public health.” The finding, presented in a report to congress, recommends surveillance, prevention, diagnosis and treatment measures for tackling the problem. Ticks and tick-borne diseases (TBDs) continue to pose an insidious and ever-present threat to livestock and livelihoods across the globe. Two of the most significant TBDs of cattle in Africa are heartwater and babesioisis, caused by Ehrlichia ruminantium and Babesia bigemina respectively. Both pathogens are endemic in Nigeria. However, to date, little data has been published regarding the number of cattle infected. In this study, blood samples were collected from cattle of the Kwara State, north-central Nigeria. Probe-based quantitative PCR (qPCR) and semi-nested PCR were used to investigate the presence of both pathogens, respectively. Our study found all samples (n = 157) to be surprisingly negative for both B. bigemina and E. ruminantium. These results contribute new information on the current burden of these two pathogens in Kwara State and may be helpful in informing more effective targeting of control strategies in Nigeria. Tick-borne relapsing fever (TBRF) is a potentially serious vector-borne disease endemic to the western United States. Vector surveillance is compromised by the nidicolous life history of the three Ornithodoros species that transmit TBRF to people in this region. Large-scale stationary trapping methods were developed to survey a wide geographical range of Ornithodoros spp. which are known to vector relapsing fever Borrelia spp. in California. Ninety-six Ornithodoros parkeri were collected from four locations in the foothills of Fresno and Madera Counties. Two of these O. parkeri nymphs were PCR positive for Borrelia parkeri, and their collection at a popular recreation site increases the public health concern. While Lyme disease (LD) is mostly treatable, misdiagnosed or untreated LD can result in debilitating sequelae and excessive healthcare usage. The objective of this review was to characterize the body of literature on the economic burden of Lyme disease (LD) and the cost-effectiveness of LD interventions, such as antibiotic treatment and vaccination. Lyme disease also known as Lyme borreliosis, is an infectious disease by a bacteria spread by ticks has raised an alarm in continental Europe, however it has not yet reached Malta. Dr Charmaine Gauci, the Superintendent of Public Health, confirmed with Newsbook.com.mt that disease has not reached Malta thus there were no risks of it spreading within the community. Analysis of surveillance data for 2010–2016 in eastern Ontario, Canada, demonstrates the rapid northward spread of Ixodes scapularis ticks and Borrelia burgdorferi, followed by increasing human Lyme disease incidence. Most spread occurred during 2011–2013. Continued monitoring is essential to identify emerging risk areas in this region. We present a precision medical perspective to assist in the definition, diagnosis, and management of Post Treatment Lyme Disease Syndrome (PTLDS)/chronic Lyme disease. PTLDS represents a small subset of patients treated for an erythema migrans (EM) rash with persistent or recurrent symptoms and functional decline. The larger population with chronic Lyme disease is less understood and well defined. Multiple Systemic Infectious Disease Syndrome (MSIDS) is a multifactorial model for treating chronic disease(s), which identifies up to 16 overlapping sources of inflammation and their downstream effects. A patient symptom survey and a retrospective chart review of 200 patients was therefore performed on those patients with chronic Lyme disease/PTLDS to identify those variables on the MSIDS model with the greatest potential effect on regaining health. Results indicate that dapsone combination therapy decreased the severity of eight major Lyme symptoms, and multiple sources of inflammation (other infections, immune dysfunction, autoimmunity, food allergies/sensitivities, leaky gut, mineral deficiencies, environmental toxins with detoxification problems, and sleep disorders) along with downstream effects of inflammation may all affect chronic symptomatology. In part two of our observational study and review paper, we postulate that the use of this model can represent an important and needed paradigm shift in the diagnosis and treatment of chronic disease. A $15,000 Lyme Disease Association Award has been received for an ongoing field study throughout Pike County, of ticks that carry disease harmful to people. Michael Mrozinski, Director of the Pike County Planning Department, made the announcement at the Commissioners’ meeting December 19. The funds will be used for the Pike County Tick-Borne Disease Study. Mrozinski said the entire surveillance project cost is $47,000. Other funding sources are also being sought to lessen the impact on the county. “We see this as a great benefit to be able to get a base-line of the issues here in Pike County. We have a lot of cases,” Mrozinski said. According to a new study published in Experimental and Applied Acarology on January 10, 2019, the lone star tick has a preference for human female breath. This is the 1st research to demonstrate human gender preferences for lone star ticks. These findings suggest either that chemical compounds in female breath attract the lone star ticks, or that male breath repels them, the authors concluded. Tickborne diseases are on the rise, and one in particular is emerging in the United States and Canada. Human babesiosis is an infection that can cause a range of symptoms and even death. Little is known about one of the parasites that cause human babesiosis but a team of Yale-led researchers have developed a novel system for studying it. Their research holds promise of leading to more effective diagnosis and better treatments, they said. Reported cases of vector-borne diseases in the United States have more than tripled since 2004, characterized by steadily increasing incidence of tick-borne diseases and sporadic outbreaks of domestic and invasive mosquito-borne diseases. An effective public health response to these trends relies on public health surveillance and laboratory systems, proven prevention and mitigation measures, scalable capacity to implement these measures, sensitive and specific diagnostics, and effective therapeutics. However, significant obstacles hinder successful implementation of these public health strategies. The recent emergence of Haemaphysalis longicornis, the first invasive tick to emerge in the United States in approximately 80 years, serves as the most recent example of the need for a coordinated public health response. Addressing the dual needs for innovation and discovery and for building state and local capacities may overcome current challenges in vector-borne disease prevention and control, but will require coordination across a national network of collaborators operating under a national strategy. Such an effort should reduce the impact of emerging vectors and could reverse the increasing trend of vector-borne disease incidence and associated morbidity and mortality. Jana Pearce was walking through Lane Cove National Park, not far from Sydney’s CBD, when she was bitten by about 30 newly-hatched ticks. Ten days later, after eating beef for dinner, she went into cardiac arrest and was rushed to hospital. Four days of tests at the Royal North Shore Hospital failed to determine why her heart had stopped. “My heart was perfectly healthy,” she said. But then came a diagnosis that changed her life: she had developed a mammalian meat allergy from her tick bites. Those creepy, crawly creatures are living up to their nasty reputation. In brief, the summary of a second season of a statewide survey of ticks confirms what most people fear – a high percentage of the bloodsucking, pincer pests are carriers of disgusting diseases that are easily transmitted to hosts. Scientists have gained a better understanding of a potentially fatal tick-borne virus that emerged in China about a decade ago.Researchers from the University of Southern California (USC) may have finally discovered the molecular mechanisms behind severe fever with thrombocytopenia syndrome (SFTS), a condition that has stumped researchers since 2009 when it was discovered to be caused by the Asian longhorned tick (Haemaphysalis longicornis). Vets painstakingly removed more than 500 paralysis ticks from a carpet python after it was found clinging to life in a swimming pool covered in the parasites. Experienced snake catchers Tony and Brooke Harrison discovered the traumatised snake wrapped around a pipe in a semi-filled pool at Coolangatta on the Gold Coast on Thursday – with Mr Harrison calling the case ‘the worst he had ever seen’. After explaining to the pool’s owner how the snake was trying to drown the ticks, Mr Harrison wrapped the reptile in a towel and took it to a wildlife hospital for treatment. Researchers from the Johns Hopkins Institute in Maryland, USA studied the effectiveness of essential oils in eradicating the Lyme disease bacteria. Lyme disease is a bacterial infection that is spread to humans through the bite of infected deer ticks. The early manifestation of Lyme disease is a localized skin rash. It is named after the town of Old Lyme in Connecticut, USA where it was first reported and is the most common tick-borne infections in the US. To the naked eye, the Asian longhorned tick isn’t much different than other ticks found in the United States: It too has eight legs, a round body, and mouthparts that latch onto its chosen host. But this arachnid is native to East Asia—where it has been shown to spread disease—and it’s quickly moving through the eastern part of the country. It’s also the first new invasive tick species that the country has seen in some 50 years, according to the Centers for Disease Control and Prevention. Many of us aren’t very good at going to the doctor at the best of times; apart from the hypochondriacs among us, most normal people usually put off a trip to the doctors until it’s absolutely necessary. Although we all know we should go as soon as we notice a symptom, many times, it’s easier to let it slide until it can’t be ignored. Occasionally, this kind of attitude can have very serious consequences for our health, as if we let things go for too long, they have a chance to expand into our systems, sometimes without us even knowing about it. Lyme disease has 6 times more new cases each year than HIV/AIDS, yet it receives less than 1% of the funding.